One of the easiest shots in golf. When it comes to hitting the simple bump-and-run shot from just off the green, I teach it the same way to all of my students. 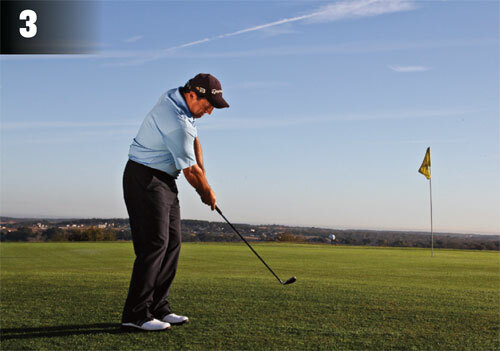 It doesn't matter if you're a tour pro or a beginner, this shot requires the same basic fundamentals. When it comes to hitting the simple bump-and-run shot from just off the green, I teach it the same way to all my students. 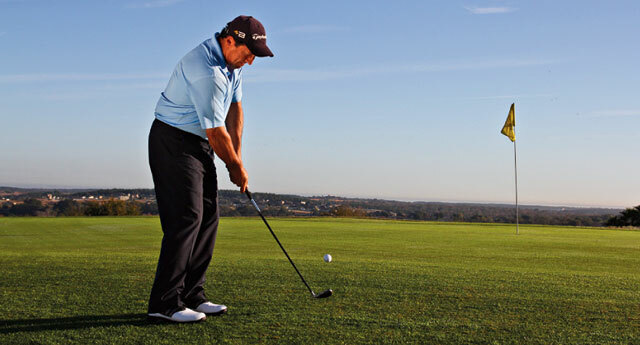 It doesn't matter if you're a Tour pro or a beginner, this shot requires the same basic fundamentals. The good news is, it's one of the easiest shots in golf, as long as you know the right technique. I like to see a basic bump-and-run hit with a club that gets the ball on the ground and running as quickly as possible. This means minimum air time and maximum ground time. I wish it wasn't called "bump-and-run" actually, since there really isn't a bump anywhere! If anything, it would be better if it were called a "chip putt" because I teach students to approach the shot like they would a putt, but hit the shot like they would a chip. To start, before you even make a stroke, closely read the length and break of the shot, with emphasis on the last four to six feet when your ball slows down, since this is where your ball breaks the most. Pick your intended line and stick with it. Next, choose the right club for the shot. I like to use anything from my pitching wedge all the way down to the 7-iron. The key is in how much green you have between the ball and the hole. If it's a long shot, try less loft. If it's closer, say, within 20 feet, try a higher loft. Just don't bother with anything more than 56 degrees. You don't need it here. 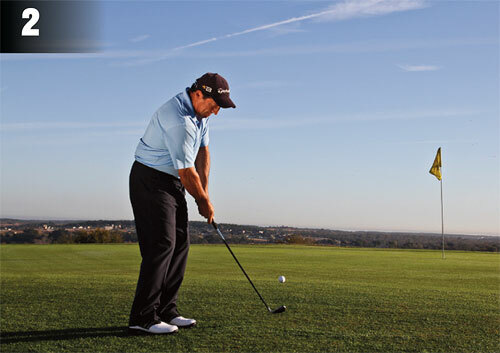 Set up to the ball with a narrow stance and place the majority of your weight on your lead foot. Here's the important part: As you make the stroke, you have to accelerate through it, so don't feel as though you need a big, long backstroke. Keep it on the shorter side. 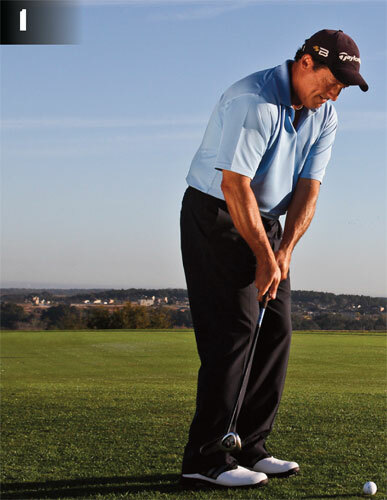 Second, keep the club low to the ground as you make a shallow—but still descending—stroke into the back of the ball. Don't feel as though you need to lift the ball up. Remember, this shot is a lot like a putt, so keep the club low and shallow out that angle of attack. I like to think of giving the grass a little haircut. There's no digging here. Third, and probably most importantly, keep your body and head QUIET! As you can see in the photos, I like to tell my students to "listen for the ball to land on the green" prior to coming up and out of your posture. You want to avoid jumping up and out of your posture prematurely. Instead, listen for the ball to land. In the photos, you can see my eyes haven't moved as the ball is chipped and on its way to the hole. That's what you want. The bump-and-run usually rolls more than most pitches and chips, so practice how far the ball rolls with different clubs. Keep your stroke the same length; adjust your club instead. This makes it a cinch when the time comes to guess the right yardages. The stroke always stays the same! Finally, I love teaching my students the Feedback Drill I'm demonstrating here. The goal is to learn terrific distance control. Lay a club down three to four feet behind the hole. Hit five to six chips, with your goal of getting all the balls either in the hole or between the hole and the club. If you miss one, start over again until you reach your goal. You'll quickly see that focusing on how the ball rolls and how far it goes will help you take focus off the stroke and more on the shot at hand. It always ensures you get the ball to the hole more often, helping to make it easier to get up and down. Give this drill a whirl. I know it will help your "chip putts" from various places around the green.